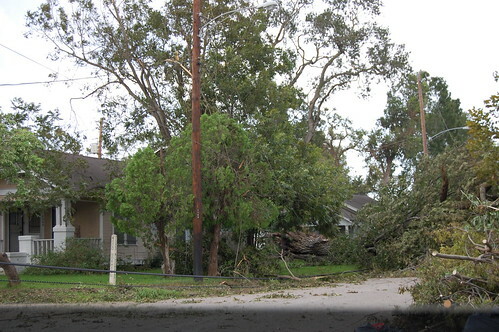 Last night I uploaded my Hurricane Ike photos to share with you, and I realized that almost all of them are of broken and felled trees. 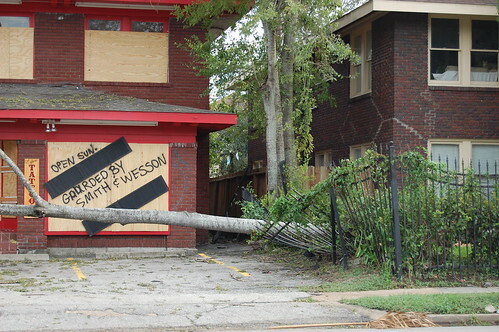 It's not that I don't care about the damage to structures; I do. I feel compassion for people who've lost their homes or are dealing with roofs, leaks, flooding, and broken masonry, fences, and hearts. But I think the truly dramatic photos that capture human suffering are taken by far better photographers and are available to anyone online and on television. Also, I just love trees. I love their grandeur. I love thinking of how they've been around longer than us and will be standing when we're gone. I love the music they make when the wind blows through them. The shade they provide us--and often their bounty of nuts and fruits. The home and playground they provide to wild things. Some of the best memories of my life are of playing under trees, climbing them, and walking through them in forests. The day before Ike came, I took some photos outside. 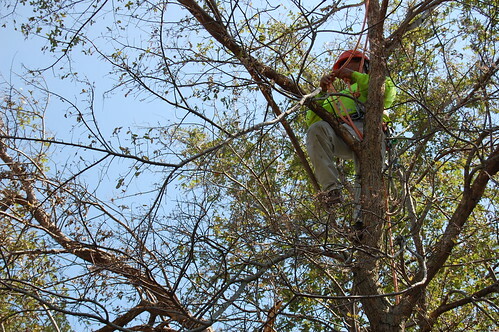 I stared up into my elm at all the nests, unsure if they were birds' or squirrels' nests. I watched the doves and jays and cardinals--the pigeons and grackles that other people dislike, but I rather admire--and all the little birds whose names I don't know, and wondered how they would fare. 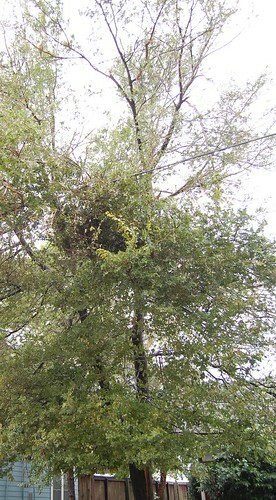 After Ike, with the elm split in two and many of its branches gone, the nests are gone, too. I haven't awakened to the sound of the mourning doves for over a week now. 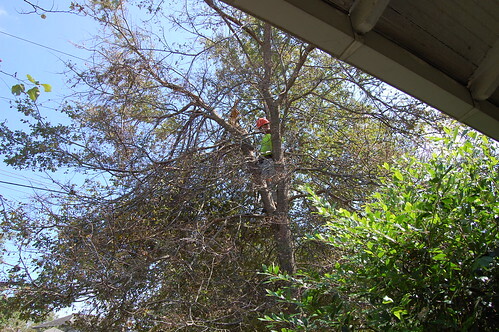 Today a power company crew took our tree down. I know it had to go. It was broken, and sooner or later it would fall. 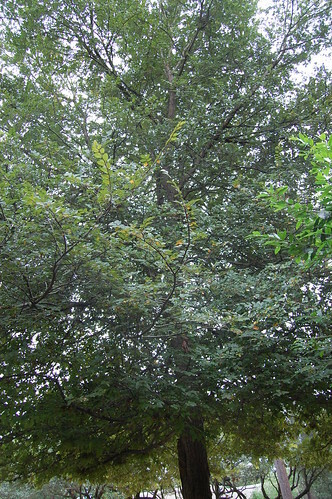 We'll plant again, of course, but I will miss my pretty elm, and I know the birds and squirrels will miss it, too. As I told Tim a few days ago, he and James have taught me to make peace with pruning because it's necessary for new growth, so I will think of Ike as Nature pruning herself. 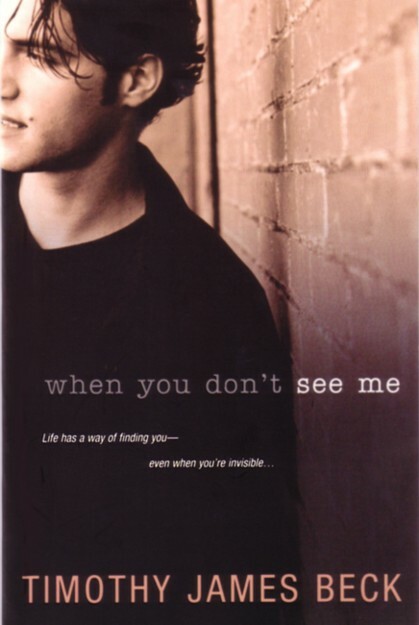 Still, I think the loss of old friends always deserves to be noticed. 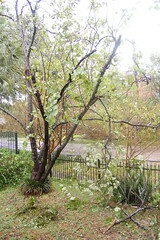 The Compound's front elm before the hurricane. 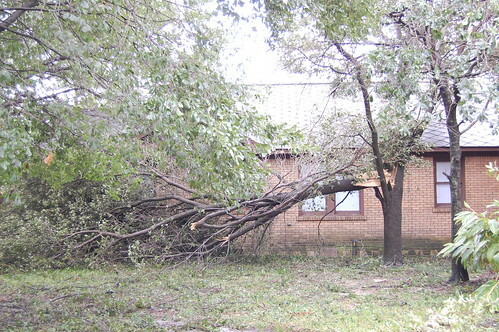 Same tree, after the hurricane. 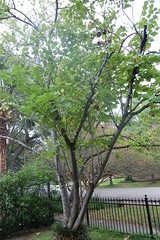 Within days, the leaves were brown, the limbs were brittle, and the tree was obviously dying. 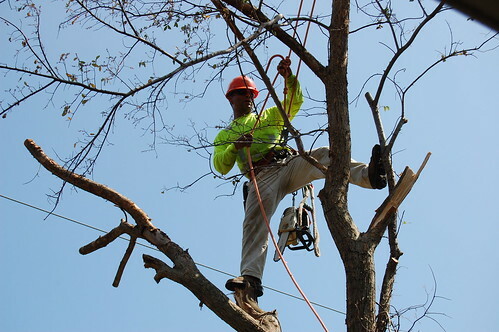 We knew we'd need a tree service, but of course, they are all being worked to capacity. The phone guy told me AT&T alone had contracted a large percentage of crews, many of them working in Galveston. 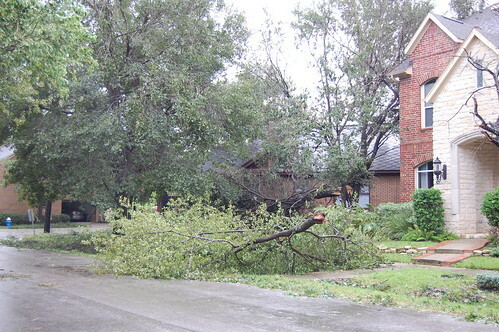 So today, when Tom saw Centerpoint Energy working on fallen and broken trees in the neighborhood, he asked them to check ours. 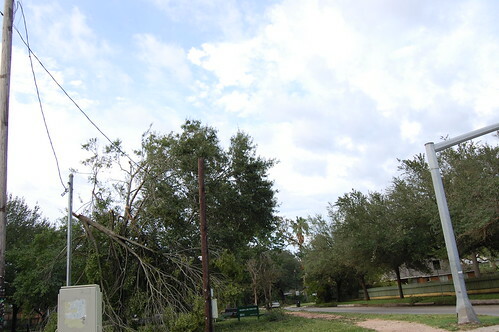 Fortunately, since it was a threat to power lines, they were willing to take it out for us. This was a HUGE relief, because we worried about the damage it could do if we couldn't get it taken out in a timely manner. Goodbye, Elm. I suppose we can grow grass now. The following are some photos I took throughout various neighborhoods last weekend when I went out with Lindsey, Rhonda, and Mark. Not too bad. Tree down in the distance. 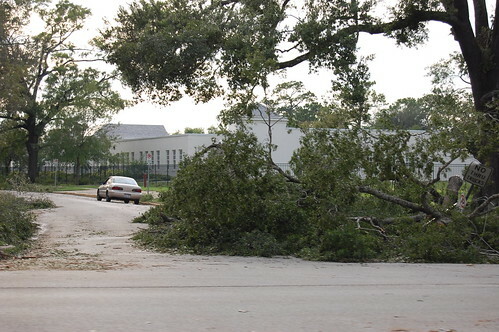 Two large trees fell toward each other and are completely blocking the street. 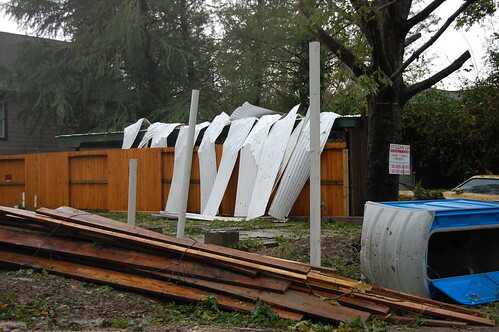 For David and Mark, an overturned portapotty, along with someone's shredded carport roof. 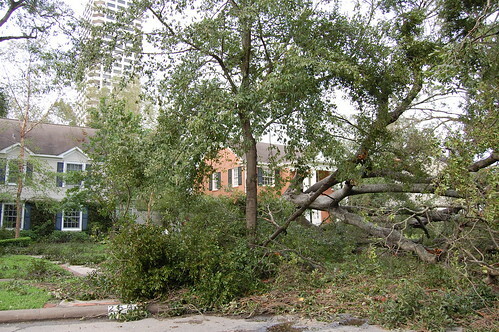 Luckily, in most places, trees fell away from houses. And some only lost limbs. 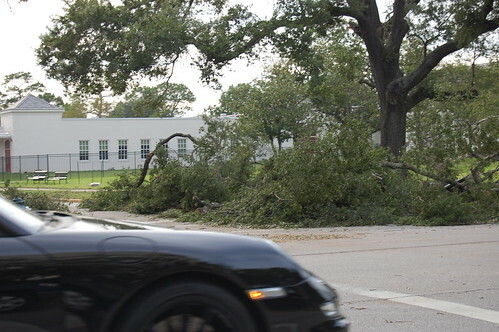 In the background, huge old tree down and blocking the street. 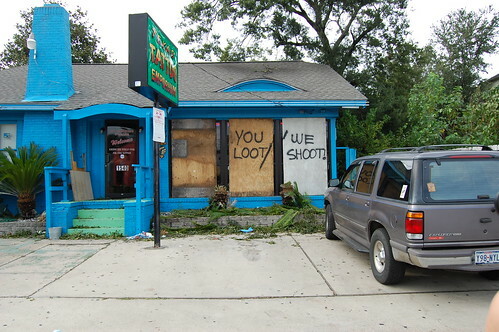 There has been looting, but nothing compared to what could happen in a city of four million-plus. Needless to say, this optimistic message spraypainted before the storm didn't pan out. They were not open Sunday. But they had kindly urged, "BE SAFE HOUSTON." This is not a pond. 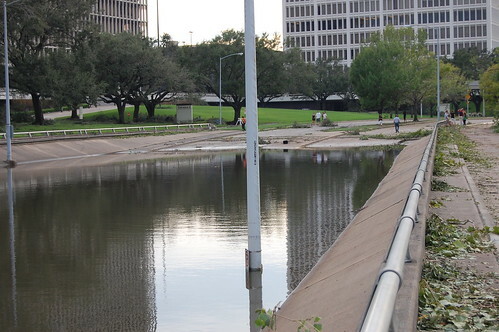 Allen Parkway is a main road into downtown. It was under about eleven feet of water. 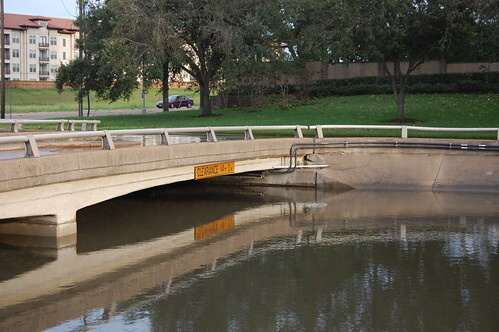 The water on Allen Parkway seems obvious. Looking west, however, on higher elevation, it looks dry. And that's how stuff like this flooded and stranded car happens. 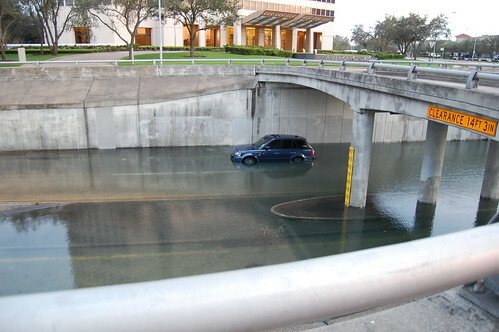 In the driver's defense, they are called "flash floods" for a reason. 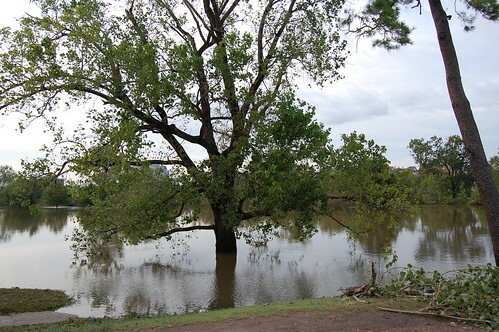 A road is passable, and in a matter of moments, with heavy rain, it can be flooded. Especially when we've already accumulated a lot of rainfall over the previous hours. This also is not a pond. It's a grassy bowl in a park alongside Allen Parkway. It was submerged under several feet of water. and dogs are (illegally) running off leash. Rhonda and Mark look at the flooding while Lindsey shoots. Later, Rhonda and Lindsey were interviewed by Fox News. They said great things about Houston. I know everyone's experience hasn't been as good as The Compound's. 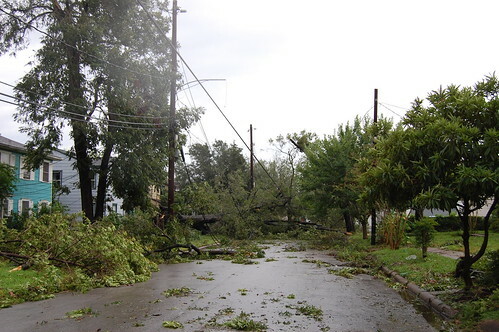 We were lucky to get power back quickly. 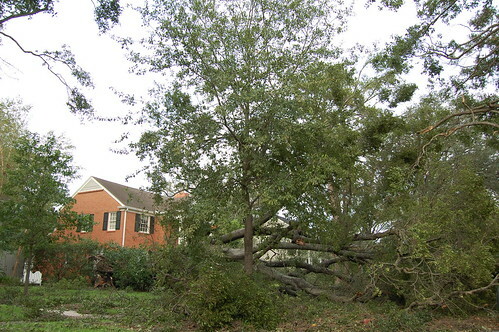 We were really lucky that none of our trees fell onto our new roof. We were lucky to have friends to share their provisions with us. 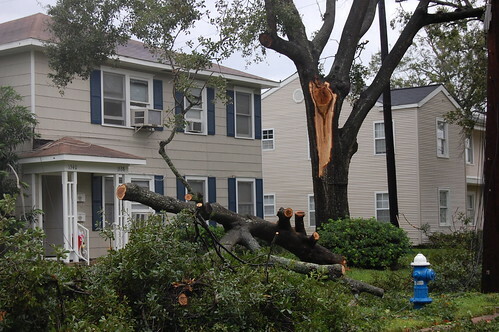 We were lucky most of our friends sustained no serious damage to their homes, and that no one was injured. It isn't that way for everyone, I know. Some people are still suffering damage and deprivation, and some will be for a long time to come. But in our neighborhood, and many of the neighborhoods we've visited or where our friends live, the stories are the same. 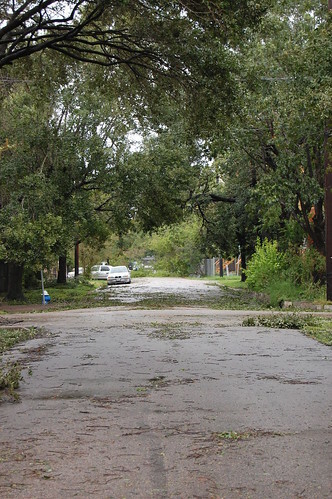 People began cleaning up as soon as daylight came after a miserable hot and rainy night. Neighbors were out helping neighbors. People dragged out the grills and had block parties, cooking and sharing all their food before it could go bad. 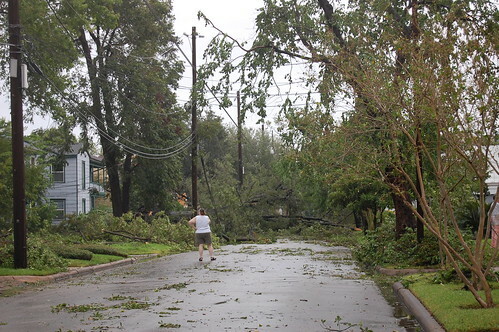 When our power returned, we kept making ice and taking it to our neighbors who had no power. 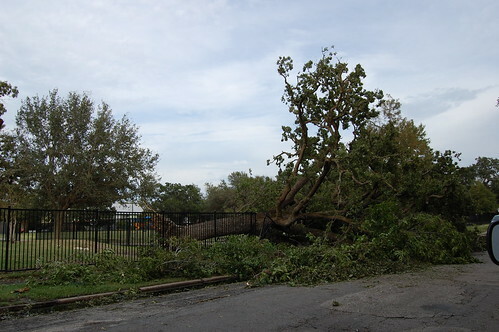 Our next-door neighbor immediately began cleaning up damage that affected our yard as well as his. Another neighbor with a gas stove baked five blackberry pies from his crop and brought us a pie. We all kept checking on one another throughout the days that followed. I was impressed with the way Mayor White was everywhere throughout the city, trying to coordinate relief efforts and keep people informed. 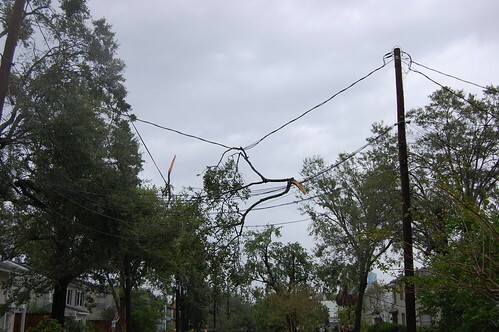 I have been awed by the phone, cable, and power crews (many of them on loan from other states) who have worked day and night to restore power and other services. 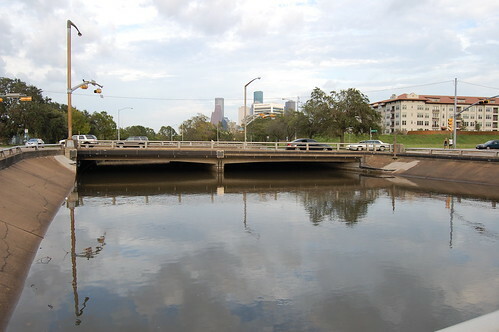 Houston's not just a city with a lot of people, it's a city that extends outward for dozens of miles in every direction. 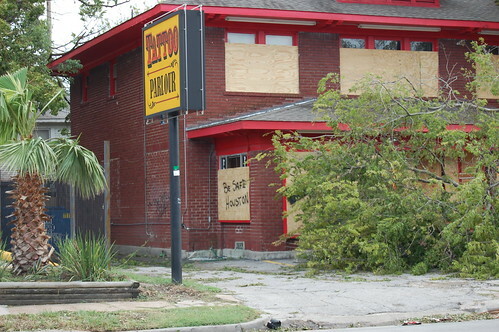 Getting people and businesses up and running is daunting, but the city has been, and continues to be, up to the task. Houston, Texas, is my adopted home, and I have to say I've never been prouder of its spirit. 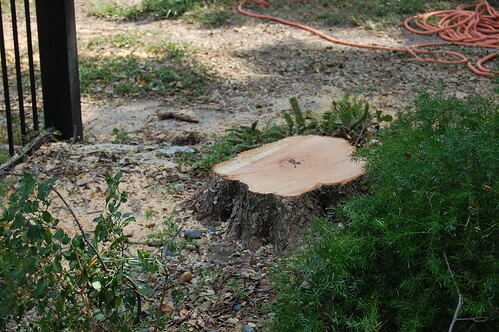 And the trees: They'll be back.